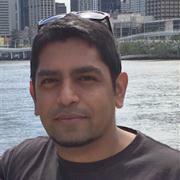 Rakesh came to Australia in 2002 to study a Masters in Biotechnology at the University of Queensland. Upon finishing, he worked as a research assistant until he recieved a PhD scholarship at the Australian National University, researching a multigene kinase family in Arabidopsis. Rakesh is highly knowledgeable in the fields of epigenetics and siRNA, however, in recent years has started to shift his focus to computational biology and database curation. He aims to reduce the boundaries between biology and computational biology by encouraging interdisciplinary cooperation between biology and other disciplines. SIR Li I, Wu X, Do T, Nguyen V, Zhao J, QinNg P, Burgess A, David R (2018) Quantitative and single nucleotide resolution profiling of RNA 5-methylcytosine. Epitranscriptomics Methods and Protocols, 1870. Wang D, Gu J, David R, Wang Z, Yang S, Searle IR, Zhu JK, Timmis JN (2018) Experimental reconstruction of double‐stranded break repair‐mediated plastid DNA insertion into the tobacco nucleus, The Plant Journal, 93 (2): 227-234. David R, Burgess A, Parker B, Li J, Pulsford K, Sibbritt T, Preiss T, Searle IR (2017) Transcriptome-wide mapping of RNA 5-methylcytosine in Arabidopsis mRNAs and non-coding RNAs. The Plant Cell, tpc. 00751.2016. Burgess A, David R, Searle IR (2016) Deciphering the epitranscriptome: A green perspective. Journal of Integrative Plant Biology, 58 (10): 822-835. Burgess AL, David R, Searle IR (2015) Conservation of tRNA and rRNA 5-methylcytosine in the kingdom Plantae. BMC Plant Biology, 15 (1): 199. Keys JR, Tallack MR, Hodge DJ, Cridland SO, David R, Perkins AC (2007) Genomic organisation and regulation of murine alpha haemoglobin stabilising protein by erythroid Kruppel‐like factor. British Journal of Haemotalogy, 136 (1): 150-157.